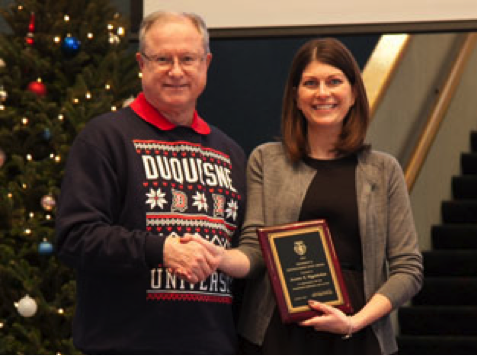 Suzanne Higginbotham, Pharm.D., was honored with the President's Distinguished Service Staff Award at the annual staff holiday luncheon on December 23, 2014. Duquesne President Charles Dougherty presented Dr. Higginbotham with the award, which is described on the university's website as "the highest honor Duquesne University bestows." The award is presented each year to "an individual who dedicates his/her mind, heart, and soul to his/her work at Duquesne University. It is awarded to the staff member who consistently demonstrates excellence in the work place, dedication to the Mission Statement, and enhances the reputation of Duquesne University. The employee transcends the duties and responsibilities that are expected to be fulfilled throughout the normal course of employment." "I was extremely honored to receive this award and thankful for the nomination from the executive team," said Dr. Higginbotham. "I am very blessed to work with such an amazing group of people and have the support of the administration at the school of pharmacy and university in order to provide services to the Duquesne University students, staff and surrounding community." Dr. Higginbotham has served as the Director of the Center for Pharmacy Care since 2010. "Dr. Higginbotham's work for the University, the School and the Center for Pharmacy Care is outstanding service," said Dr. J. Douglas Bricker, Dean of the School of Pharmacy.